Reproduced in brilliant colour, this portrait of Norval Morriseau is a tribute to the spiritual founder of the Woodland School of Native Canadian Painting. 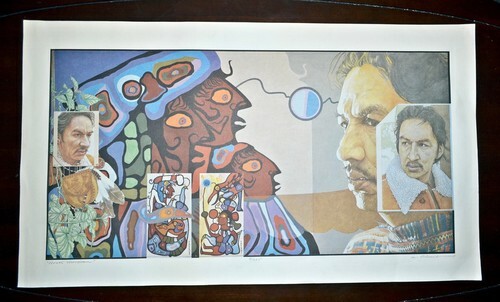 Color Photolithograph - Size: 25" X 14 1/4", Image: 22" X 11 1/2"
Norval Morrisseau is the most original and important artist, native or otherwise that Canada has produced. Norval was the first to paint the ancient myths and legends of the eastern woodlands, stories previously passed down by the oral tradition. He spent his youth in remote isolation in northern Ontario, near Thunder Bay, where his artistic style developed without the usual influences of other artist's imagery. As the soul originator of his "Woodland" style he has become an inspiration to three generations of artists. Norval was brought up by his grandfather who introduced him to Ojibwa shamanism and told him the stories and legends passed down amongst the Ojibwa people. Norval began producing images to illustrate these stories. He would draw on the sandy beaches of Lake Nippagon with a stick and let the waves take the images away. He was told by some that it was taboo to relate these stories. Norval Morrisseau is not a man that is easily dissuaded by ancient taboos. He developed his style, adding striking color to his paintings and eventually took them south to Toronto where they were meet with rave reviews. His work now hangs in all of the most prestigious museums in Canada and around the world. He has received an honorary degree from the Royal Academy of Arts and is a member of The Order Of Canada, the highest civilian honor in Canada. In 1989 he was the only Canadian Painter to be invited to participate in the "Magicians Of The Earth" exhibition at the Museum of Modern Art in Paris, France. He has had numerous solo shows across Canada and the US. His highly collectible work invokes our memories of childlike simplicity. His colors effect us in ways that are not immediately apparent. His visions, like ancient taboos that have turned into dreams of the future, come to life on.